Until the recent sour turn of Europe, all signs were positive this year, and Spring 2012 was one of our best quarters in the last 4 years. Americans are purchasing yachts as well as Canadians and South American clients. On the personal side, I took a yacht delivery to Saint Maarten and had an excellent time as seen by the beautiful beach photo above. New listings included a couple of dive boats that are seriously for sale. 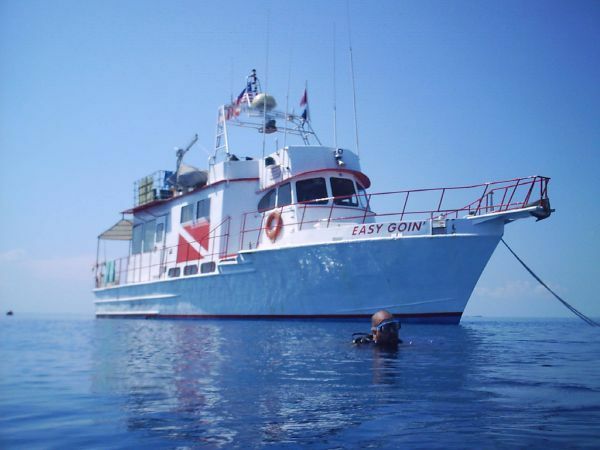 Easy Goin’ is an incredible dive platform ready for treasure hunting in the Keys, Caribbean, and beyond. Please do not hesitate to give me a call for more details. Coming up is hurricane season starting this Friday, June 1st. Despite what people say, this season does not limit sales although a percentage of the local inventory does head north because of insurance restrictions or to take advantage of Mid-Atlantic and New England events. What are your plans for Summer ’12 in Fort Lauderdale? I hope to see you shore side or help you cut the docklines and fulfill your sea dreams.